Where do I begin? 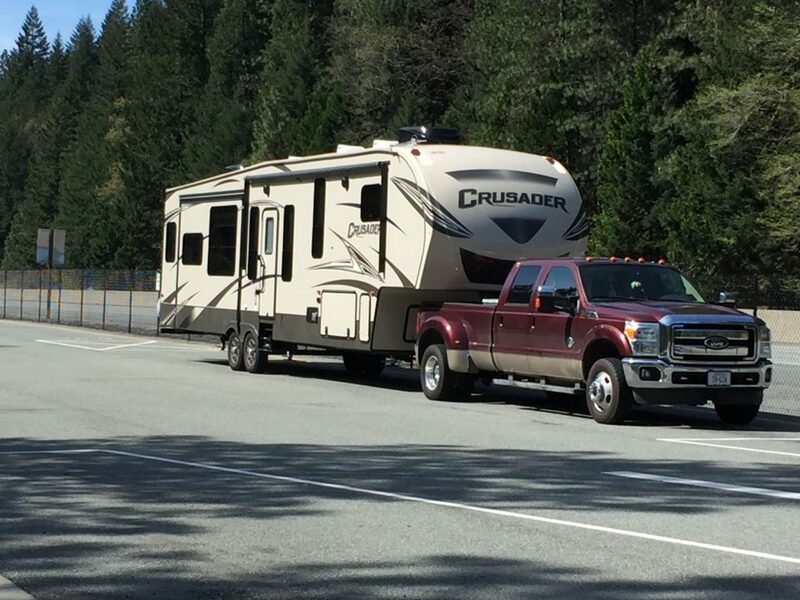 As I have blogged over the past two years, my husband and I purchased a 2016 Forest River Crusader 5th-wheel trailer and a Ford F350 dually truck to pull it. This all came about when he lost his job with Cabela’s corporate offices after they were involved in a hostile takeover that eventually led to Cabela’s selling to Bass Pro. Yes, for those who don’t know, Bass Pro is now the official owner of Cabela’s. 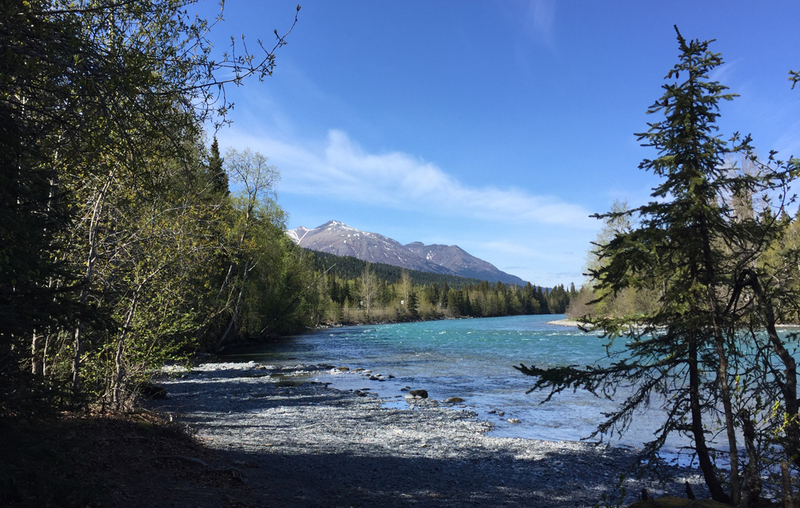 At that time, we decided to put our house on the market in February 2016 and drive to Alaska to work as campground hosts at Cooper Creek National Forest Campground along the Kenai River in Cooper Landing, Alaska. We began our adventure in Loveland, Colorado so we would be close to the dealer when it came to working out quirks from the trailer’s newness. From the short three-hour drive from our home, the curtain rods in the closet fell and we had scratches on the glass doors on the kitchen and pantry cabinets. Our first showers revealed that no one had caulked the shower and water leaked everywhere. Within a week or so we needed a new board for the refrigerator and a new board for the furnace. Remember, this trailer is only a few months old. From the moment we left Loveland, Colorado, Miss Adventures of being a modern nomad arrived in our life and began her activities. The first event happened when our pre-owned truck decided to lose 6 of its 8 cylinders over Donner Pass. We had a delay of 10-days while a dealer in Auburn, California waited for the parts to arrive from Tim-Buk-Too. We were able to have a wonderful visit with our son in San Jose and enjoyed the beautiful yard of my husband’s cousin where we parked our rig. The next adventures occurred as we traveled the freeways and cabinets and curtain rods fell off the walls. Even the shelves of the pantry eventually cracked and broke and we had to replace and reinforce them. But the greatest Miss Adventure of the first year occurred in Quesnel, British Columbia when our tires were slashed in a Walmart parking lot by Steven Gattenby, a disgruntled hater of the United States. We were forced to buy several tires for our trailer and our truck. The adventures continued in the Yukon Territory when I thought someone was sabotaging our trailer again, but it was only a 6.4 earthquake and its aftershock. 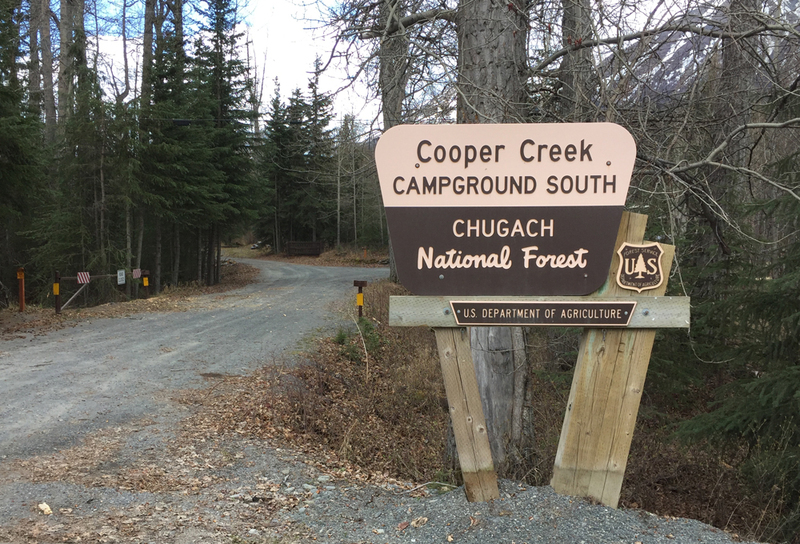 Eventually we ended up at Cooper Creek Campground and worked for Alaska Recreational Management! We love you all! 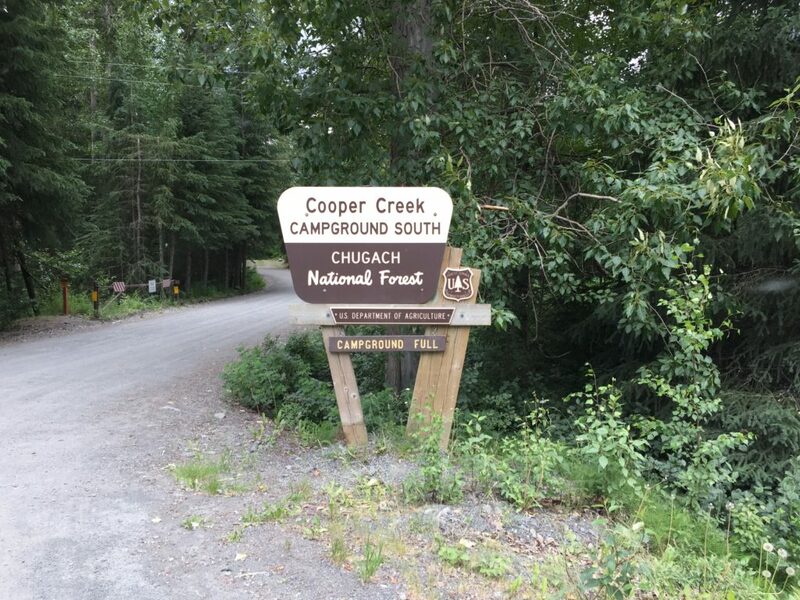 Year number two began uneventful (yay), but when we arrived at Cooper Creek campground for our second summer, we noticed a small crack in the exterior of our trailer between two of the slides. This caused great concern because we had met other hosts whose fifth-wheel front fell off due to the frost heaves. We didn’t want that to happen to us and had our trailer ‘x-rayed’ before we left Loveland the second year. We were told everything looked safe and sound! As the trailer sits for the summer, the crack remained about 2-3 inches long. 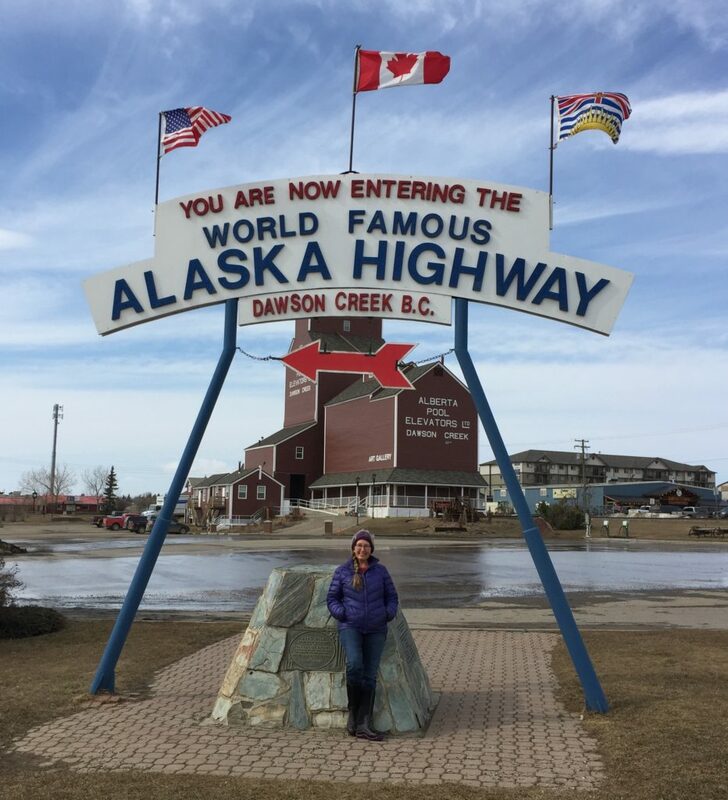 When the summer ended, we packed up and headed south toward the US on the Alcan Highway. 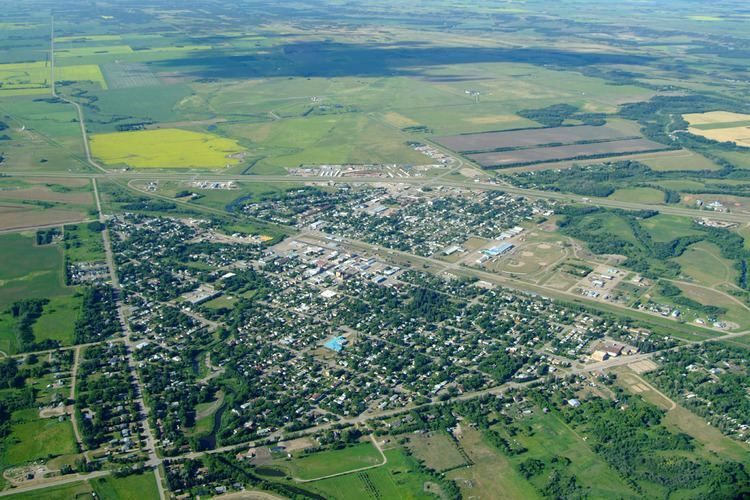 Many people ‘hear’ that the Alcan is a horrible highway. Probably until the last 20 years it was a difficult travel, but early on in the 1950s – 1980s, it was dirt in many places and frost heaves abounded. What is a frost heave? According to the dictionary, “it is the uplift of water-saturated soil or other surface deposits due to expansion on freezing; a mound is formed by frost heave, especially when broken through the pavement of a road.” A frost heave can be minor, but the major ones wreak havoc on vehicles and trailers, especially on those who drive fast! All of the present-day Alcan is paved so it’s really good road except for those places further north where there are frost heaves. 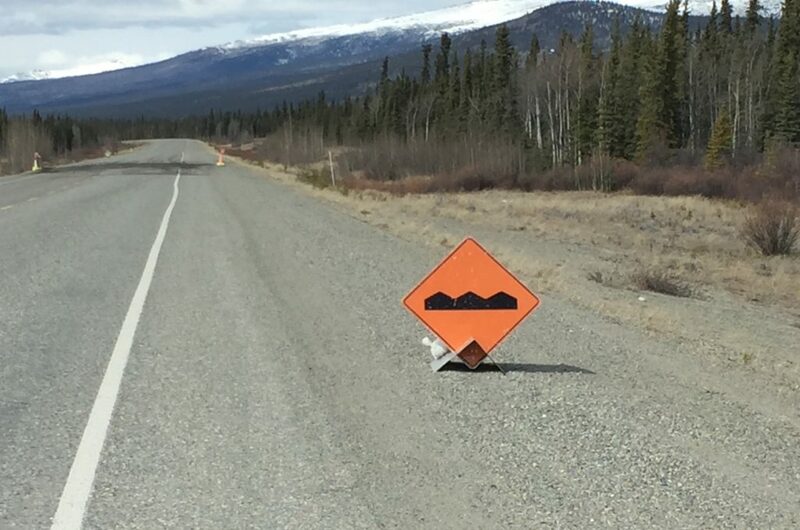 Most heaves are marked with signs or red flags, but some appear suddenly and road maintenance crews can’t mark each and every one. We knew that our travel south with the crack could be … well, merciless on our trailer. 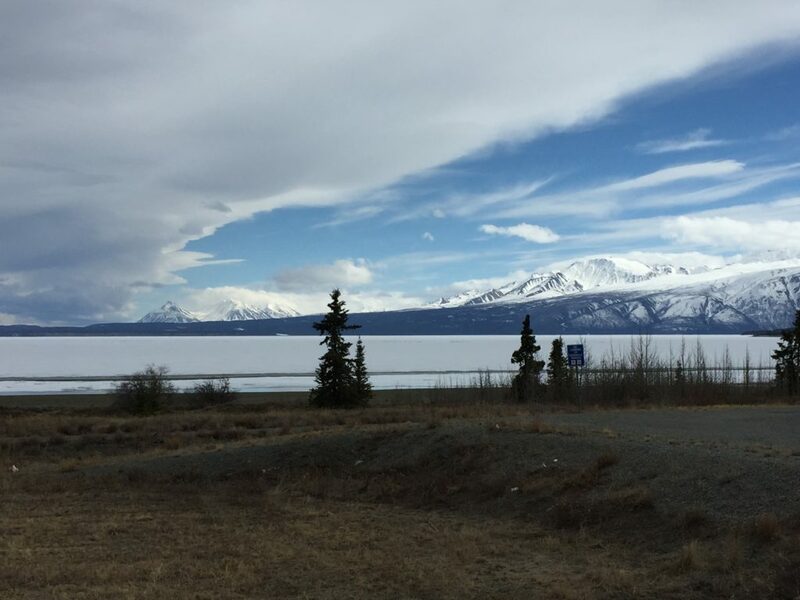 The worst part of the Alcan is in the Yukon Territory at a village called Destruction Bay (population 48), not because of destruction by frost heaves, but because of its destruction from wind storms off the bay on Kulane Lake during the military construction of the road in 1942. In the past two years, the maintenance crews have made this section quite nice, nicer than most sections of the road. Still, the pavement tends to be bumpy and slow-going. Several days into our trip south, we stopped at Destruction Bay for fuel. The gas station/ motel looks dumpy on the outside, but to our surprise was very nice inside and we bought several bottles of Yukon maple syrup! When we checked our crack, it had lengthened to about 6-9 inches. As we traveled and stopped for the night, we needed to open the slides and began to notice they were very sluggish coming in and out. One slide, the side with the most weight (fridge, stove, pantry, fireplace and TV) had actually stressed the vinyl on the inside flooring until it cracked. I put some clear packaging tape over it so that it wouldn’t ‘catch’ and tear the whole floor. Sluggish slides are normal when you open them once or twice a day on battery power, but they were sluggish when we were plugged into electrical power. And, we were opening and closing them several times a day: closing in the morning when leaving a campground, opening and closing for a lunch stop, and then opening for our evening stop. Our trips lasts about 2 weeks so that is 26-28 times that the slides were opened and closed during the trip south. We worried that ‘this time’ they might not actually come in or out, however, we kept pressing on toward ‘home’ where the dealer could look at it while still under Warranty. By the time we traveled through British Columbia, Montana, Wyoming and Colorado to our home in Nebraska, the crack had lengthened to nearly 12 inches and we began noticing cracks to start on the four corners of each of the slides. We made an appointment for it to be checked and dropped it off for a two-week inspection. The dealer found that the cracking was not only on the outside, but also the inside. The axles and leaves of the axles were flattened not allowing for the correct suspension and so with every bump on the highway – and Alberta, Wyoming and Colorado are worse than the Alcan – the entire trailer was being jolted. After their two-week inspection, we had an extensive meeting with the major players at our dealer. We discussed the options under the two-year Warranty for the frame. Forest River, the manufacturer, wanted a gazillion photos, a stress test and a Camber test so they could be ready to fix the issues in mid-February as we needed it by May 1 to return to Alaska for our third year at Cooper Creek. We had found a winter job hosting and would be spending the winter at Cherry Creek State Park in Aurora, Colorado so the trailer would sit quietly and hopefully nothing more would happen to make it impossible for it to be picked up and driven to Indiana. 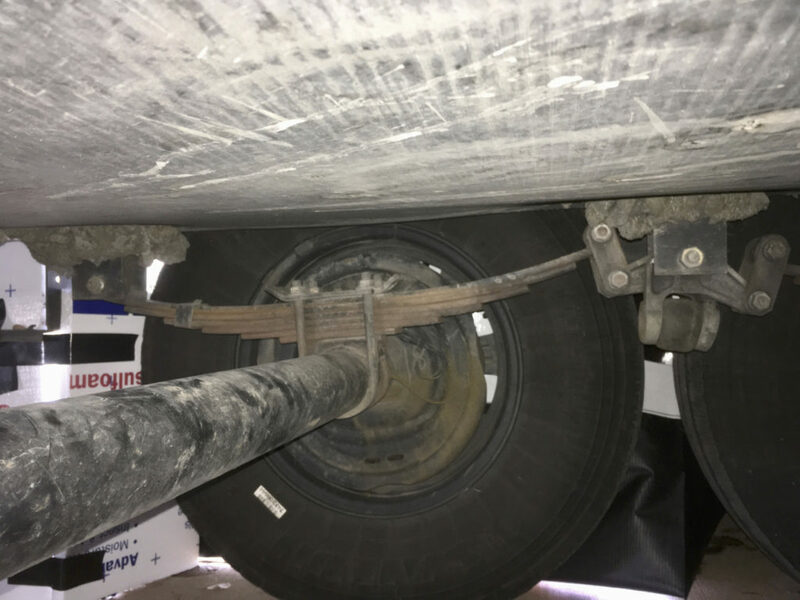 The pictures taken over the next few months started revealing the underlying reason for the damage to the trailer – the axle leaves. The springs were completely flat. There was little to no suspension and eventually the trailer began leaning toward the driver’s side, the refrigerator began sticking because it no longer sat square and our bathroom door which once was able to stand open would slowly close as the trailer leaned toward that side. Three separate times we heard loud BANGS and the trailer would shift – to this day we have no idea what that was or what it means. It is now the beginning of February and we’re preparing to send our trailer to the manufacturer in Indiana. We rented a storage unit – our house sold and closed January 30 so we no longer have a ‘home’ apart from the trailer – and began to box everything up in the trailer. We caled the dealer and eventually the manufacturer only to find out that no one reserved the mid-February date on the service calendar – neither our dealer nor anyone at the manufacturer who should have been following through on all of the photos! One employee said he had never even heard of us or our situation even though the photos had been sent to him at his request. He apparently really didn’t want to deal with us because during our call for information he hung up on us. We are now in another Miss Adventure. We have to leave Cherry Creek at the end of March. To be in Alaska by the first of May we have to begin our trek by mid-April. We have to have a trailer for traveling and for living. Forest River can’t and WON’T make an appointment with us in spite of this great gaffeur until July (which won’t work) or next October, an entire year after the initial inspection and the original determination that our Crusader needs extensive work! One employee of Forest River actually told us to drive it to Alaska and back. He wouldn’t give us a guarantee that it would make it without falling apart – in fact, he said it wouldn’t fall apart as he’s never seen such a thing in 20 years of working with trailers. As camphosts we meet a lot of very interesting people from everywhere in the world. At Cherry Creek, we met Italians who homeschool their three children in their toy hauler, world schoolers from the Netherlands who travel the world with their children, and four radical road schoolers with a fat cat who just happened to stop at Cherry Creek before heading for several months to the Colorado mountains for an extensive ski trip. As we chatted about our issues, their faces froze. They had their very own Miss Adventure. 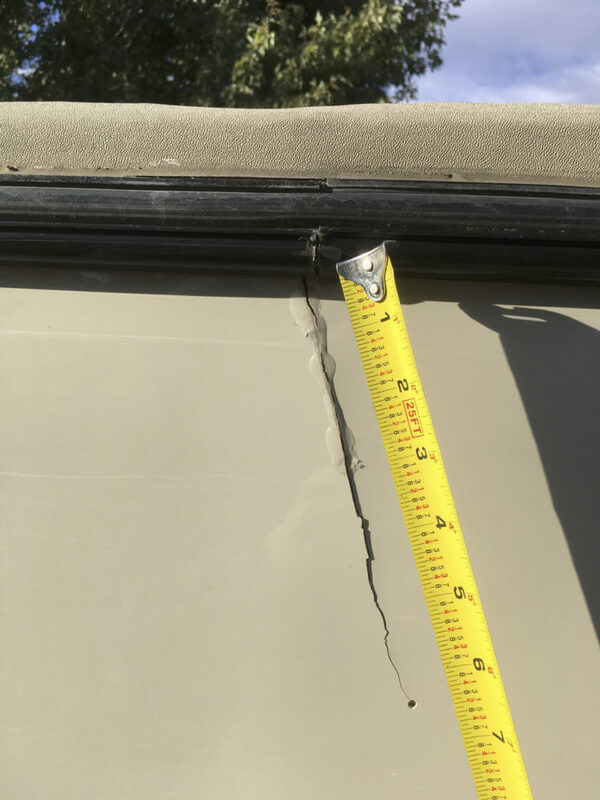 After looking at our cracks, they told us they had similar cracking in their Heartland fifth-wheel (and they’ve never been to Alaska) that were superficially fixed under their Warranty. 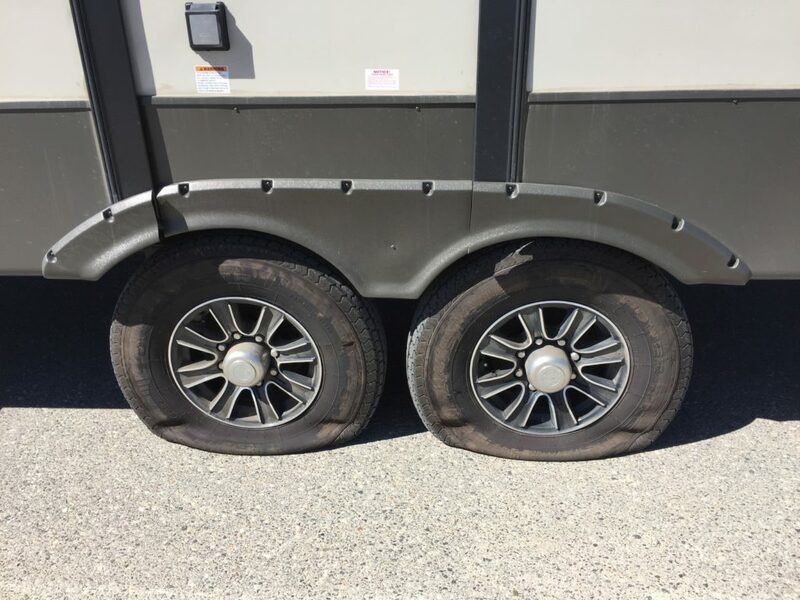 While driving in the northeast toward Canada, their fifth-wheel completely fell apart. 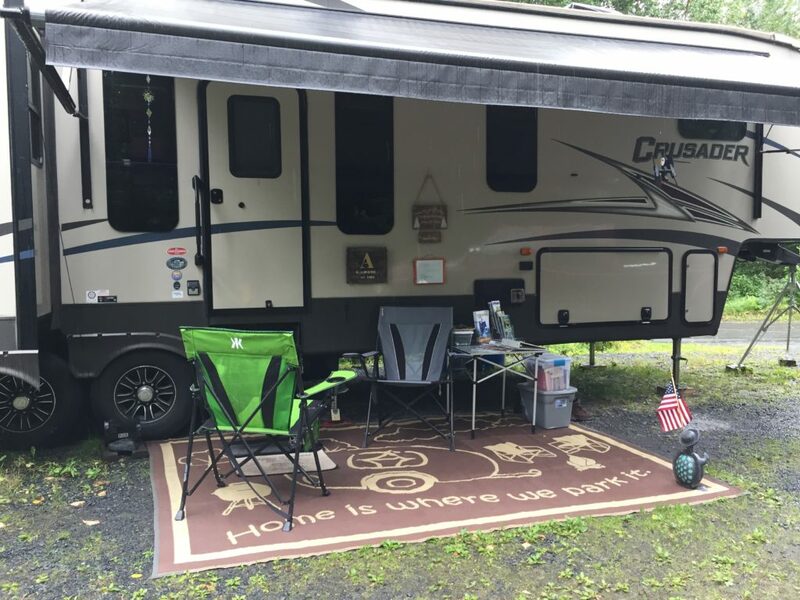 They limped to an RV park where Heartland wouldn’t help them because they were no longer under Warranty and they refused to back up their product and its frame (made by Lippert who owns the market on RV frames). Yes, the superficial fixes didn’t fix the problems with their frame and their axles! This family has been on social media, radio shows and have their own blog that has reached 100,000 people and still Heartland has no heart to make things right. They eventually paid off their loan, abandoned their trailer at the RV park for parts and trash and had to buy a new one – a totally different brand. We are not so far into our Miss Adventure, but with similar cracking, slides that are mis-aligned, flat suspension and most likely a bent frame, we are not interested in driving to Alaska and having our trailer disintegrate somewhere in the desolation of the Yukon Territory. We are not interested in parts flying off and hurting another traveler or having our trailer become dis-membered and perhaps cause serious injury to us. It seems no one considers that liability when traveling with a trailer is known to have extensive issues needing to be repaired. Is all hope lost? Never. First we have an amazing Creator, Father, Provider, and Warrior for a King and God. We have been praying for His favor and mercy on us and, as one friend reminded us ‘many counselors make for wise decisions’ (Proverbs 15:22). So we have been counseling with many different people from many different angles to come up with fair and viable options. As of today, we are still in a waiting period while our dealer, (the dealership was sold January 1, 2019 to make things even more interesting) processes the idea that we trade-in our rig for a good deal on a new one while they send ours to the manufacturer at their leisure and re-sell it as a pre-owned trailer. For us that is the best option at this point for both our living needs and traveling needs as well as timing for our Alaska job, BUT the decision is up to who and what is left of the dealership in MANITOBA, Canada. Yes, Manitoba, Canada! If they accept our option, we may have to drive our trailer to that dealer (Loveland is more realistic as Manitoba adds the danger aspect of the travel) and drive the new one back to Colorado where everything we own is in storage. But, hey, we’ve never been to Manitoba and one of the reasons we are full-time modern nomads is to see and visit places we have never been. At this point in our Miss Adventure, we are hopeful that the dealer will help us resolve all of these issues. We will be able to do a trade-in in Canada and resume our nomadic lifestyle. As for the manufacturer, Forest River, we won’t say anything negative until they truly act contrary to their corporate Code of Ethics apart from the slamming of the phone. No matter what is said to them by who, they still can’t grasp that we need our trailer before May 1 and they are not making any attempt work this problem through with us our our dealer. Apparently, even if they would work with our timing, Forest River is not known to be reliable on completion dates so really going that route would be as bumpy as a frost heave. We have been asked if we filed an insurance claim. Yes, we have. Unfortunately, insurance is for accidents not failure from manufacturing problems especially when still under Warranty. We can’t prove the cracking issues came from the frost heaves so they can’t use that as an accidental cause though in a round about way it may be. What we are hoping for from the insurance company is that an adjuster will come out and decide whether or not the trailer is safe for driving. After all, they aren’t going to want to pay out liability money already knowing the trailer is not safe to drive. 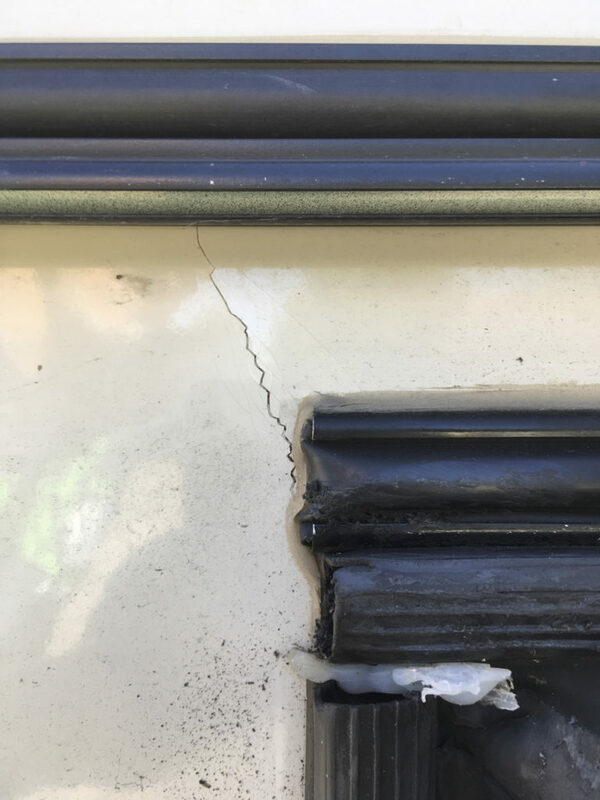 Their inspection will just confirm our concerns with the ‘someone’ who thinks driving our trailer with cracks back and forth to Alaska is a not good idea. In the meantime, we are looking at new fifth-wheel trailers. Unfortunately, we may have to settle for another Forest River, but then maybe not. God knows the plan and we are just walking this whole adventure out step by step. We love our trailer, but it’s no longer made. We loved having the middle bunk room for an office, extra storage and a room for grandchildren sleepovers, but we also believe that some of the problems the trailer encountered was because it is 42-feet long with only two axels. We are looking for something a tad shorter with better axles and a hitch with suspension. 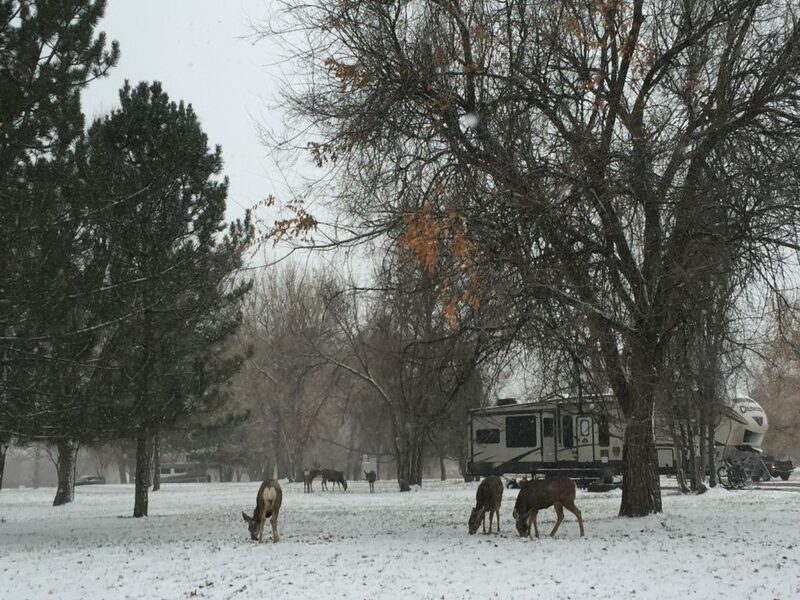 Until we know whether or not our idea becomes a real option, we remain in Camphost spot #1 at Cherry Creek State Park Campground in Aurora, Colorado until the end of March. Come visit us if you’re in the area!